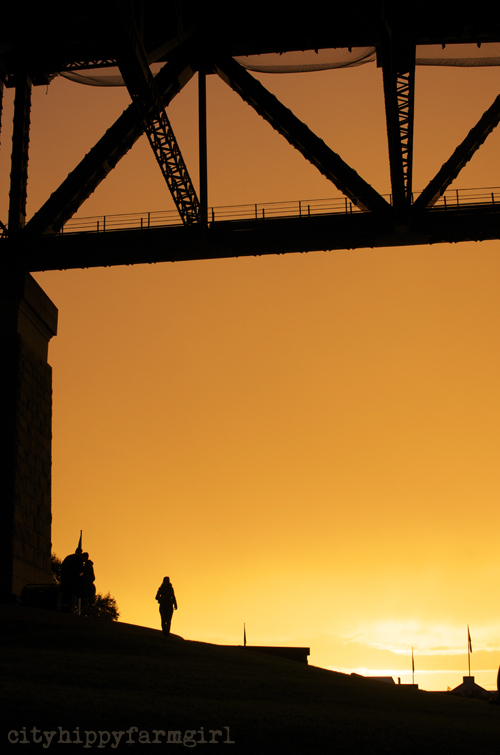 Sunset under Sydney Harbour Bridge…it was rather beautiful. This entry was posted in Photography and tagged city living, city of sydney, Photography, sunset, sydney, vivid by cityhippyfarmgirl. Bookmark the permalink. Now that is a shot. Awesome contrasts – and a beutiful image. So iconic. And this is when I call Australia Home. You have transported us back to Egyptian time where they worshiped Atum, the setting of the Sun God. Just breathtaking. I wonder what an ancient Egyptian would make of the construction of our harbour bridge? What a photo! You have to be very pleased with this one. I find the glorious reds and oranges of sunsets hard to capture on camera. I was Richard. Super happy. The light on that afternoon was absolutely amazing as in every other direction there were storm clouds. 10 minutes later it poured down. Thanks for your lovely compliments, I do enjoy photography and am hoping I’m slowly getting better.